Sudden cardiac arrest is the abrupt loss of heart function, breathing and consciousness. The condition usually results from an electrical disturbance in your heart that disrupts its pumping action, stopping blood flow to your body. Sudden cardiac arrest differs from a heart attack, when blood flow to a part of the heart is blocked. However, a heart attack can sometimes trigger an electrical disturbance that leads to sudden cardiac arrest. If not treated immediately, sudden cardiac arrest can lead to death. With fast, appropriate medical care, survival is possible. Giving cardiopulmonary resuscitation (CPR), using a defibrillator — or even just giving compressions to the chest — can improve the chances of survival until emergency workers arrive. But sudden cardiac arrest often occurs with no warning. If you're currently having these symptoms, call 911 or emergency medical help. When the heart stops, the lack of oxygenated blood can cause death or permanent brain damage in minutes. Time is critical when you're helping an unconscious person who isn't breathing. Call 911 or the emergency number in your area. If you have immediate access to a telephone, call before beginning CPR. Perform CPR. Quickly check the breathing. If the person isn't breathing normally, begin CPR. Push hard and fast on the person's chest — at the rate of 100 to 120 compressions a minute. If you've been trained in CPR, check the person's airway and deliver rescue breaths after every 30 compressions. If you haven't been trained, just continue chest compressions. Allow the chest to rise completely between compressions. Keep doing this until a portable defibrillator is available or emergency workers arrive. Use a portable defibrillator, if one is available. It will give you step-by-step voice instructions. Continue chest compressions while the defibrillator is charging. Deliver one shock if advised by the device and then immediately resume CPR, starting with chest compressions, or give chest compressions only, for about two minutes. Using the defibrillator, check the person's heart rhythm. If necessary, the defibrillator will give another shock. Repeat this cycle until the person recovers consciousness or emergency workers take over. Portable automated external defibrillators (AEDs) are available in many places, including airports, casinos and shopping malls. You can also purchase one for your home. AEDs come with built-in instructions for their use. They're programmed to allow a shock only when appropriate. A problem in your heart rhythm (arrhythmia) — the result of a problem with your heart's electrical system — is the usual cause of sudden cardiac arrest. The heart's electrical system controls the rate and rhythm of your heartbeat. If something goes wrong, your heart can beat too fast, too slowly or irregularly (arrhythmia). Often these arrhythmias are brief and harmless, but some types can lead to sudden cardiac arrest. The most common heart rhythm at the time of cardiac arrest is an arrhythmia in a lower chamber of your heart (ventricle). Rapid, erratic electrical impulses cause your ventricles to quiver uselessly instead of pumping blood (ventricle fibrillation). Coronary artery disease. Most cases of sudden cardiac arrest occur in people who have coronary artery disease, in which your arteries become clogged with cholesterol and other deposits, reducing blood flow to your heart. Heart attack. If a heart attack occurs, often as a result of severe coronary artery disease, it can trigger ventricular fibrillation and sudden cardiac arrest. Also, a heart attack can leave scar tissue in your heart. Electrical short circuits around the scar tissue can lead to abnormalities in your heart rhythm. Enlarged heart (cardiomyopathy). This occurs primarily when your heart's muscular walls stretch and enlarge or thicken. Then your heart's muscle is abnormal, a condition that often leads to arrhythmias. Valvular heart disease. Leaking or narrowing of your heart valves can lead to stretching or thickening of your heart muscle. 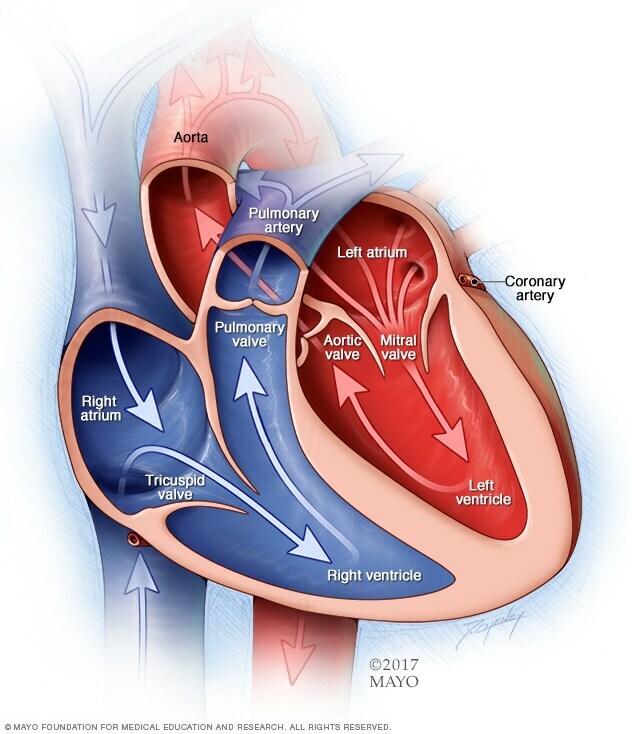 When the chambers become enlarged or weakened because of stress caused by a tight or leaking valve, there's an increased risk of developing arrhythmia. Congenital heart disease. When sudden cardiac arrest occurs in children or adolescents, it can be due to a heart defect that was present at birth (congenital heart disease). Adults who've had corrective surgery for a congenital heart defect still have a higher risk of sudden cardiac arrest. Electrical problems in the heart. In some people, the problem is in the heart's electrical system itself instead of a problem with the heart muscle or valves. These are called primary heart rhythm abnormalities and include conditions such as Brugada's syndrome and long QT syndrome. When sudden cardiac arrest occurs, reduced blood flow to your brain causes unconsciousness. If your heart rhythm doesn't rapidly return to normal, brain damage occurs and death results. Survivors of cardiac arrest might show signs of brain damage. Reduce your risk of sudden cardiac arrest by getting regular checkups, being screened for heart disease and living a heart-healthy lifestyle. Jameson JL, et al., eds. Cardiovascular collapse, cardiac arrest, and sudden cardiac death. In: Harrison's Principles of Internal Medicine. 20th ed. New York, N.Y.: The McGraw-Hill Companies; 2018. https://accessmedicine.mhmedical.com. Accessed Oct. 30, 2018. Sudden cardiac arrest. National Heart, Lung, and Blood Institute. http://www.nhlbi.nih.gov/health/health-topics/topics/scda/. Accessed Oct. 30, 2018. Podrid PJ. Overview of sudden cardiac arrest and sudden cardiac death. https://www.uptodate.com/contents/search. Accessed Oct. 30, 2018. About cardiac arrest. American Heart Association. https://www.heart.org/en/health-topics/cardiac-arrest/about-cardiac-arrest. Accessed Oct. 30, 2018. CPR steps: How to save a life. National Safety Council. https://www.nsc.org/home-safety/tools-resources/infographics/cprsteps?gclid=CjwKCAjwyOreBRAYEiwAR2mSkgMUOGmOKcYNNGV9ZM-eyhHhM38XfqGDG6FzITGlBdHfCfbExXGySBoCoWIQAvD_BwE. Accessed Nov. 1, 2018. Heart failure. National Heart, Lung, and Blood Institute. https://www.nhlbi.nih.gov/health-topics/heart-failure#Diagnosis. Accessed Nov. 1, 2018. Common tests for heart failure. American Heart Association. https://www.heart.org/en/health-topics/heart-failure/diagnosing-heart-failure/common-tests-for-heart-failure. Accessed Nov. 1, 2018. Ejection fraction heart failure measurement. American Heart Association. https://www.heart.org/en/health-topics/heart-failure/diagnosing-heart-failure/ejection-fraction-heart-failure-measurement. Accessed Nov. 1, 2018. Sudden cardiac arrest (SCA). Heart Rhythm Society. https://www.hrsonline.org/Patient-Resources/Heart-Diseases-Disorders/Sudden-Cardiac-Arrest-SCA . Accessed Oct. 30, 2018. Brown AY. Allscripts EPSi. Mayo Clinic, Rochester, Minn. Aug. 14, 2018.